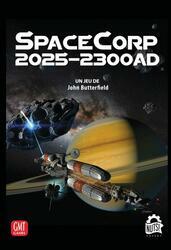 SpaceCorp 2025-2300 AD is a board game in which one to four players explore and grow in Space over three eras. Each player controls a land-based company in search of profits through the expansion of Humanity in the solar system and beyond. Players can choose to do a quick game, covering only one epoch, or can play the full game covering all three eras and representing three hundred years of human expansion into the cosmos. A specific system is included for solo mode and covers all three eras. Players take turns to take action with their teams and bases. Your turn is to play one or more cards of the same type of action, with the option to increase the board in infrastructure, a time card or the abilities of a base. For example, playing Move cards with a total value of 5 allows you to move a team from the Earth to a Solar Lagrange point. Other maps allow a team on an asteroid or moon to explore it, or build a base like a spaceport, refinery or biology lab. You can also play cards to conduct research (draw new cards), produce (take advantage of a site with resources), do genetics (gain genetic benefits for your teams), make discoveries (progress towards technological breakthroughs), launch actions such as space probes and prototypes. Some cards can be played as an infrastructure, giving you permanent bonuses in future actions. During the game, you earn profits through exploration discoveries, producing on resource sites and obtaining contracts. For example, a browser-era contract rewards the first player to build a base on Mars. The player with the most profits at the end of the game wins but there are many ways to get there.